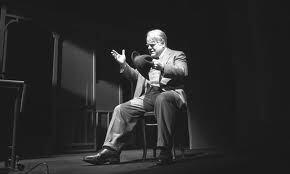 In the guise of Philip Seymour Hoffman, the mid-twentieth century victim of urbanization, progress, and the delusions of facile success as image, Willy Loman emerges as the defiant lion of the twenty-first century; not a 99 percenter or a TEA Party activist, but a true believer in the American myth, to the bitter end, as bitter as the gorgeous solemnity of Arthur Miller's finest work allows him. The stirring new Broadway staging of "Death of a Salesman" at the Barrymore Theater is as good as live theater gets, with an intense cast of emotionally charged players straining with each scene to match Hoffman's mesmerizing shifts in and out of Loman's manic mood swings, his bi-polar hallucinations, and long, disturbing pauses that leave the room bereft of oxygen again and again. Hoffman polimorphically manifests jazz great, Miles Davis' immortal line about the emotion of all music being found in the silences, the notes not played as pertinent as the ones heard. Hoffman is a ferociously broken wing of the post-war affluence of American spirit, as Loman is written and has been played for more than half a century and on Broadway four different times during parts of six decades, but he is never defeated, roused like a schlep Lazarus or as the whispering voices in a foxhole near the end of a battle the doomed cannot win but cannot yet admit they will never exit alive. Miller's aim for his timeless tragic anti-hero was to lull audiences into sympathy before the crushing denouement when the truth of the man's illusions destroys his meager legacy, his fractured family, and his barely subsistent pride. Hoffman, while respectful to the historic playwright, manages to turn this well-crafted ruse on its head by tearing open Loman's fears of irrelevance into a defiant protest, refusing to accept being unloved, unsuccessful and lost in a time and place not of his making. But it is not Hoffman for whom this play shines brightest, but his co-star, the young and talented Andrew Garfield, in his stage debut as the ever-wandering loser, Biff. Best known, as is Hoffman, for his film work, most recently as Eduardo in "The Social Network" and soon-to-be the newest Peter Parker aka Spider-Man, Garfield instinctively commands the stage at his most vulnerable and crazed. Opening the play in boxers and a tank-top tee, his taught muscles and ruffled hair depict a yearning for an escape out West, away from the crushing pressures of the city and his childhood expectations. He closes it strangled by the imprisoned business attire he dons against his will to save his father's life. Garfield physically becomes the myths of the play. Here at their nadir, Loman and his son are pitted against each other, held together by blood and lies, as both rage against the machine that churns on without them, even when, for a fleeting second years ago, deep in the glory days of fading sunshine, they are on a suicide run together; one ideological, the other quite literally. And here, to his credit, Hoffman is generous with his skills. As in many of his films, he allows others to shine, expanding his role by sharing the spotlight. Whether playing opposite Meryl Streep in "Proof" or "Along Came Polly" with Ben Stiller or "Magnolia" with Tom Cruise or "The Savages" with Laura Linney, Hoffman duly supports his co-stars and brings the stories to life. The play's director, Mike Nichols, whose acrobatic use of symbolism in his 1968 film masterpiece, "The Graduate" that turned a dime-store novel of alienation into a generational siren, uses light and imagery, music and a constant unnerving movement to portray the banality of the urban dirge as something more than tragedy. In Nichols' hands this is a story of unrequited redemption, only because it is the insignificant little damages that lead to the unraveling of contentment in modern times, or as poet Charles Bukowski once mused, it is the broken shoelaces and not massive trauma that drives a man to madness. Nichols, who has never made a film nearing the perfection of "The Graduate", has nevertheless proven his mastery for visual metaphors, as his Death of Salesman brims with one hammering reminder after another that the worth of a man's existence in a country that had paved over most of its frontier by 1949 is ever more ambiguous. Instead, he is replaced by industry and the automobile, technology, commerce and war. Thus, all the talk about open spaces, wilderness treasures, high-rise executive mastery and daring individualism is cast inside a claustrophobic set design -- dreary catacombs from the tiny front porch to the cramped kitchen, the shoebox bedrooms set below tenement windows closing in all around. 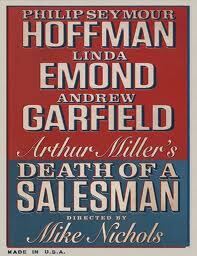 But "Death of a Salesman" is not a political or social treatise; it is a play about lies -- domestic, familial, professional and internal; all of the rationalizations and petty misdirection that salves the ticking clocks of our lives. And no one affiliated with this latest run of an American masterpiece, from small walk-ons through the four major players, is unaware of this. There is a reverence for the greatness of the work, but also a bold expanse of its most cherished moments. "Death of a Salesman" is a good as modern tragedy gets and its current revival proves it.